“The Late Show” (1977, Warner Archives Collection) When aging private eye Art Carney’s partner (Howard Duff) turns up on his doorstep with a bu llet in his chest, he decides to take up the shamus business again – despite his bad heart, hearing aid and hernia – and settle the score with the killer; his investigation dovetails with a missing person case (missing cat, really) for neurotic but well-meaning Lily Tomlin, who becomes Carney’s unexpected partner for a bona fide mystery involving stolen goods, shady fences and a few more dead bodies. 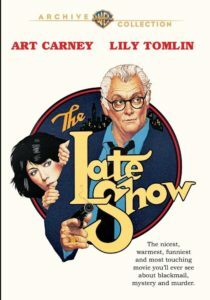 Robert Altman produced this sweetly skewed comedy for writer/director Robert Benton, whose Oscar-nominated script swirls ’40s noir and his producer’s penchant for introspective study on societal fringe dwellers into a tart and somewhat bittersweet highball; as with Altman’s own effort in this regard – “The Long Goodbye” (“Late Show” was, in fact, initially envisioned as a companion piece to Altman’s take on the Raymond Chandler novel) the result should be satisfying to followers on both sides of the fence, fueled by the breezy interplay between the two leads, who have rarely been better. They’re well supported by some ace character actors – Eugene Roche, Bill Macy, John Considine, all now mostly unknown to viewers under 40 – and Joanna Cassidy in full femme fatale mode. Warner Archive’s DVD ports over the extras from the 2005 WB home video release, which are comprised of the theatrical trailer and an odd but amusing clip of Tomlin plugging the movie on Dinah Shore’s afternoon talk show, with the Doobie Brothers (!) filling out the other seats. “Star Trek: The Animated Series – How Sharper Than a Serpent’s Tooth” (1974, Paramount Home Video/CBS Home Video) The Enterprise encounters an alien that appears to be the Aztec and Mayan god, Kukulkan, which brings Kirk, McCoy, Scotty and a Native American ensign, Walking Bear, aboard his ship to solve a mystery that will allow the winged serpent to take form once again. An Emmy winner for Outstanding Children’s Programming, “Serpent’s Tooth” is a prime example of the high quality of writing that went into Filmation’s 1973-1974 animated “Star Trek” spinoff, which tapped nearly all of the original live-action cast (save Walter Koenig) to reprise their roles. The core concept, which embraces the ancient astronaut theory, the triumph of rational thought over superstition, and the idea that numerous unrelated cultures shared similar mythologies and religious figures, is heady stuff for a Saturday morning cartoon, but it’s intelligently handled by Russell Bates and David Wise’s script and makes for a satisfying addition to the “Trek” multiverse; most importantly, it isn’t tripped up too much by Filmation’s notoriously limited animation. And if nothing else, the episode is an impressive showcase for the acting talents of James Doohan, who provides not only the voice of Scotty but also very distinctive voices for Ensign Walking Bear, Kukulkan and the three-legged, three-armed Enterprise navigator Lt. Arex. 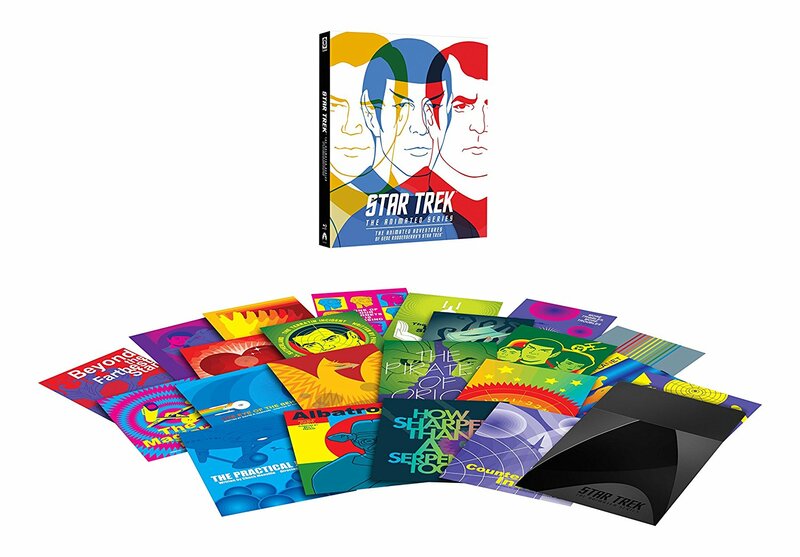 “Serpent’s Tooth” is included as part of the three-disc “Animated Series” Blu-ray set from Paramount/CBS and includes commentary by Wise, who earned his first TV credit with this episode before going on to write for “Buck Rogers,” “Transformers” and “Batman: The Animated Series.” The set includes additional commentaries, a fine making-of featurette and a set of 22 collector cards with illustrations from each episode by David Ortiz. “Doc Savage: The Man of Bronze” (1975, Warner Archives Collection) Adventurer and renaissance man Clark “Doc” Savage, Jr. leaves his Fortress of Solitude (not the one that Superman owns) and reunites with his sidekicks, the Fabulous Five (character actors Paul Gleason, William Lucking and others, clearly relishing the chance to play sort-of superheroes), to solve the murder of his father. 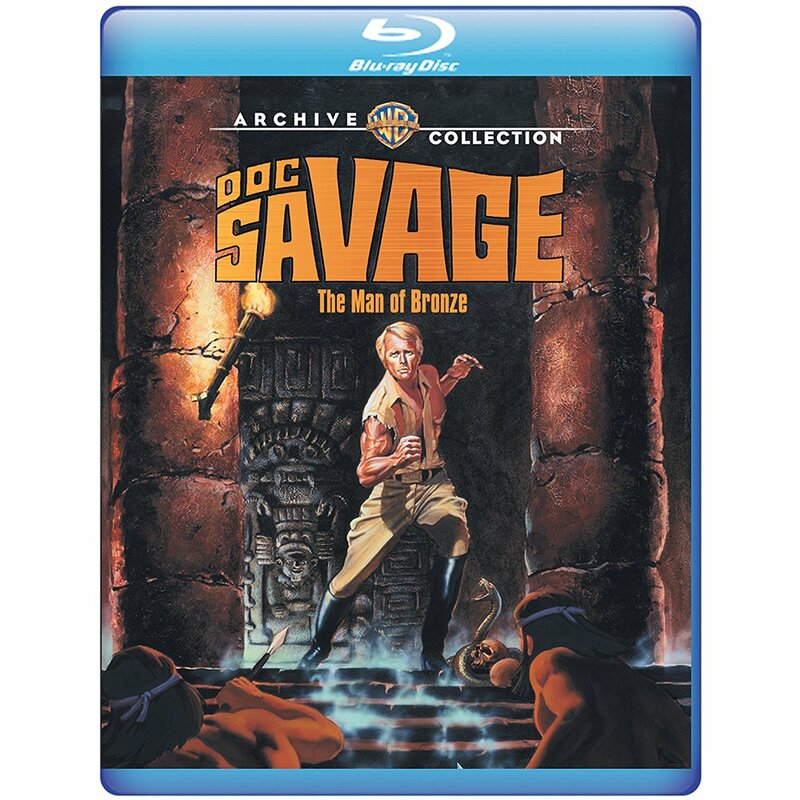 Their search takes them to Central America, where a lost Mayan tribe has been enslaved by international criminal Captain Seas (Paul Wexler) and a corrupt government official (Bob Corso) with a penchant for infantilism. George Pal (“The War of the Worlds”) produced this tribute to the long-running series of pulp adventures featuring Lester Dent’s indestructible hero, which unfortunately adopts a self-parodying tone to make the more outlandish elements palatable to mid-’70s audiences. The mix of rip-snorting action and camp upends what might have been a fun nostalgia trip, as evidenced by Pal’s script (co-written with Joe Morhaim), which remains faithful to many of Dent’s details. Ely is physically right as the beefy Man of Bronze, and Wexler is appropriately fiendish as his nemesis (though his comeuppance is more than a bit morbid); cult trainspotters will note Pamela Hensley (“Buck Rogers in the 25th Century) as Doc’s ostensible love interest, and the great Michael Berryman (“The Hills Have Eyes”) and big, bald Bob Tessier in minor roles. Warner Archives’ Blu-ray looks sharp, even without any extras. Oh, and Doc determines the Mayan origin of an assassin (stuntman Dar Robinson) by a tattoo on his chest of Kukulkan, which proves that the serpent god really was everywhere. This entry was posted in Movies, Television and tagged CBS Home Video/Paramount Home Video, Star Trek, Warner Archives Collection. Bookmark the permalink.